Written by: Archie McCallum, Glasgow, Scotland. Arriving by boat to this mysterious island on Lake Haverö, immediately you are welcomed by the sight of the spectacular, eloquent two story tree house, standing tall and proud, looking over the lake. The wonderful architecture and true craftsmanship that has gone in to this creation is clear to see and it provides for a breathtaking view. With such an impressive exterior, you climb the stairs to the entrance, intrigued as to how it looks inside – and the interior does not disappoint. The curved windows at the front let in so much natural light and the view across the lake is stunning. Climbing the spiral staircase to the upper floor, the view becomes even better. 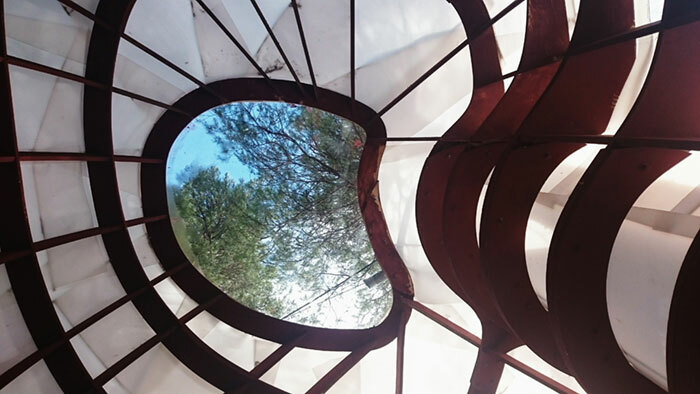 Upstairs is the sleeping area, with two large double beds where you can lie down, look directly up and see through the window at the very top of the treehouse, admiring the blue sky above the tree tops – relaxation at it’s finest. Back downstairs is a cosy living area with comfortable reclining chairs, where you can sit back, relax and take in the wonderful view. Provided is some tasty local Swedish cheese, a sweet syrup from the forest and some freshly bottled lingonberry juice. Completely locally sourced and a true taste of the forest! There are many wild flowers, mushrooms and berries you can pick – nature is all around you, as you hear the birds tweeting in amongst all the trees. As you look back out on to the lake you can see the occassional fish jump – there is a boat you can take out and see if your luck is in. A lake rich with pike and bass, it can provide for a tasty evening meal. 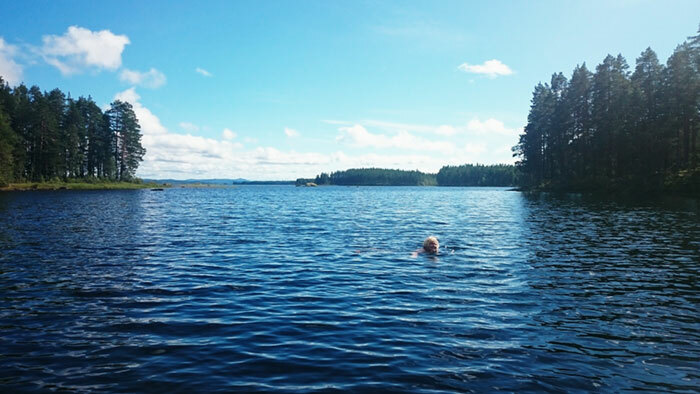 The stay at the tree house is not complete without a swim in the lake. Running out on to the jetty and jumping in to the water – to say it is truly refreshing is an understatement. Floating on your back and looking up to the sun, there is not a sound to be heard other than the ripple of the water – utter peace and tranquility. From water level, the view across the lake is really special as well. After the swim, you can take a refreshing shower outdoors, relax in one of the hammocks and listen to the silence. The electricity and shower are completely solar powered – the consideration for the environment is really at heart here. Then it’s time to light up the barbeque and cook the evening meal. There is a small outdoor enclosure with a kitchen area, perfect for preparing your food, after which you can sit down and enjoy your meal by the lake, as the sun starts to set. With a big selection of candles and tea lights placed by the windows, soon there becomes a magical display of candlelight, which looks stunning both inside and out. When it has reached complete darkness, you can walk out to the jetty and look at the tree house from a distance, as the candles inside shine bright – it is truly mesmerising. 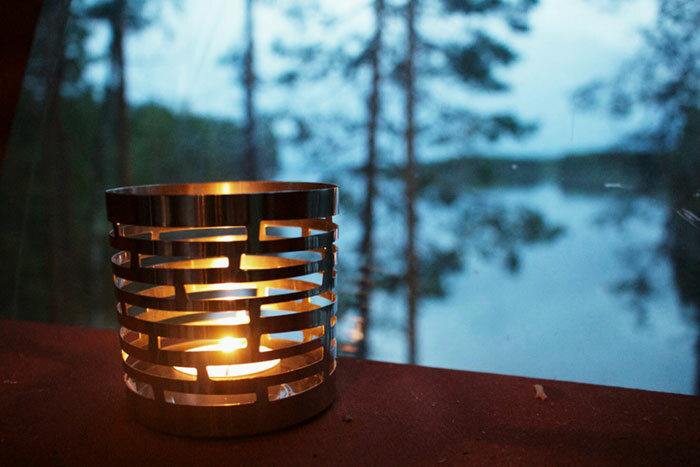 Overall, this is the perfect place to get away, to wind down and really take in the stunning Swedish countryside. It’s a great experience and adventure – living in amongst the tree tops – just you and nature. Visitors at the Tree house island, August 2016: Archie McCallum, Glasgow, Scotland, Frances Menter & Matt Menter-Mackie, Dundee, Scotland.